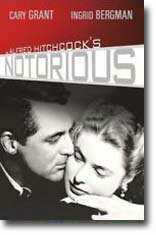 One of Alfred Hitchcock’s classics, this romantic thriller features a cast to kill for: Ingrid Bergman, Cary Grant, and Claude Rains. Bergman plays the daughter of a disgraced father who is recruited by American agents to infiltrate a post-World War II spy ring in Brazil. Her control agent is Grant, who treats her with disdain while developing a deep romantic bond with her. Her assignment: to marry the suspected head of the ring (Rains) and get the goods on everyone involved. Danger, deceit, betrayal–and, yes, romance–all come together in a nearly perfect blend as the film builds to a terrific (and surprising) climax. Grant and Bergman rarely have been better. A finely crafted, sumptuously produced romantic thriller. Rains manages to dominate almost every scene in which he appears; his Oscar-nominated portrayal of the lovesick mama’s boy engaged in espionage comes off as supremely menacing, emotionally ambiguous, and yet oddly sympathetic all at the same time. Hitchcock combines mystery and the evil’s of Nazism in this chilling story about a woman with a past. Character to watch: agent Cary Grant as agent Devlin.